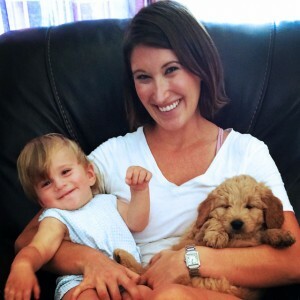 Home » Blog » Current Puppy News Feed » Puppy updates from new parents! 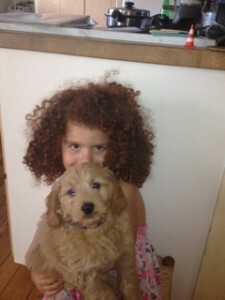 We’ve added a few messages and photos we’ve received from families that took home their new pup’s a few weeks ago. Enjoy! Hi Jim and Lynn! I just wanted to say how nice it was to finally meet you! I just wanted to give you a quick update on Tucker! He did so well on the plane ride home. He started to cry with about 30 minutes left in the flight so I took him out of the carrier and brought him into the bathroom with a disposable pee pad and put it on the floor of the plane and he knew just what to do – it was amazing! I kept him on my lap the rest of the flight and he just cuddled the whole time! He has been doing so well with potty training and using his crate! We have had no accidents and he goes right in his crate around 10:30-11:00 PM and doesn’t make a peep until I come down in the morning around 6:30 AM! Couldn’t be more happy because I like my sleep! The kids love him and are having a lot of fun with him! He is so sweet and cuddly! He still sleeps a lot and isn’t eating a ton but definitely doing better than the first couple of days. I promise to download some pictures within the next few days – it’s very busy here with 3 kids and a puppy! Thanks for the nice call earlier today! Wanted to let you how Huckleberry Finn (we haven’t decided between Huck and Finn for short…man, naming the pup was harder than naming our son but this was my beloved grandfather’s nickname and we both love books and it finally felt right!) was doing. He is just absolutely wonderful. He was great in the car home, no fussing at all, and has been a dream since we got home. He and the baby took to each other immediately and cuddle and giggle and are the cutest thing in the world (see attached video). Finn has loved exploring our house and backyard and really likes Parker’s outdoor play area, he’s already mastered the tunnel and going through the gate. He is very cuddly and sweet and has not had any potty accidents yet; we take him out hourly. He slept until 6 am today and then took a nice long morning nap around 8 am (at the same time as his big brother Parker). He hasn’t loved his crate as much during the day, he wants to be with the family, but it was better today. He’s just a joy, thank you! I want to start by saying how much I am filled with gratitude for the both of you and the amazing love and care that you have obviously given every puppy in your care! And we know you had some fabulous helpers too! Kohler seems so happy and is acting as if he’s always lived here and I know that is because of the stellar care and loving attention you have provided him every moment of his life. We promise to carry that forward! We have already begun our training which he seems to have gotten on the 3rd round..sitting and following…and giving clear potty signals! He slept a lot today here, there and anywhere he could find a cool spot…phew!! Last night he went voluntarily into his crate ( as if it were old hat) and slept from 10:30 to nearly 7 am…Bravo Kholer! After learning how to navigate the 3 steps off the deck up and down this morning, he willing went to his potty spot all day! It feels as if he has made a seamless transition from your home to ours and we couldn’t be happier. I am thrilled too with the perfection of how it all unfolded and had big smiles to see “Lulu” with her family….everyone found their way home. We feel certain we came home with our puppy. Here are just a few shots of Kohler and his delighted family. Our youngest grand daughter Madison, waited patiently to have a first lap sit, and one of Kohler during a hot mid day nap…looks like he’s flying in his dreams, and new puppy mama delighted to be rolling around on the floor with our sweet boy. Many Thanks and may your “getaway” be very restful, rejuvenating and fun!